Year after year I keep writing articles on Avoiding "INVESTMENT" in Gold...(doing it for 6 years on the trot). You are going to see lot of advertisement in the coming days to buy GOLD on the auspicious day of Akshaya Tritiya which is on 18th April 2018. 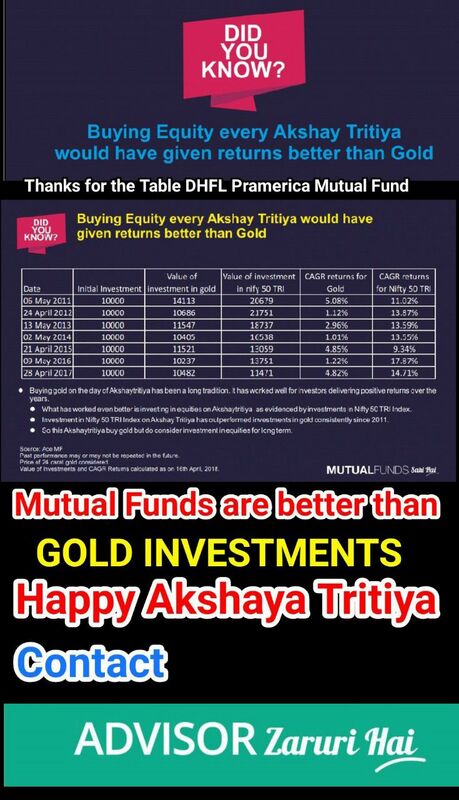 Look at what happened, if you bought Gold on this auspicious day in the past, hoping that your wealth will grow. 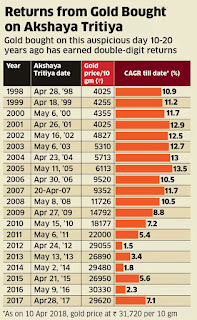 Hope this chart helps you to stay away from considering GOLD as an investment! The same time Sensex has generated better and consistent returns, still many think that it is not good investment!!! It is time to respond practically rather than emotionally. 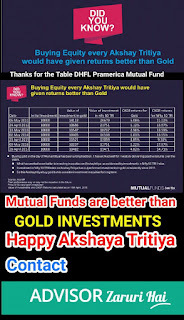 Having GOLD as a portfolio allocation is a MUST but buying it for HUGE RETURNS is a strick NO-NO. Its Growth entirely depends on belief that some other person will buy this Gold for MORE in future. And a yes gold also depends on FEAR. 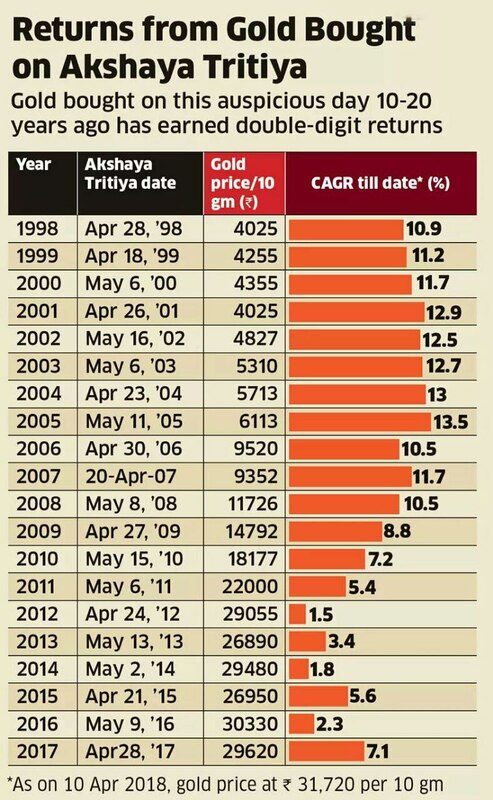 Gold Prices do tend to soften after Akshay Tritiya and Wedding Season in May. 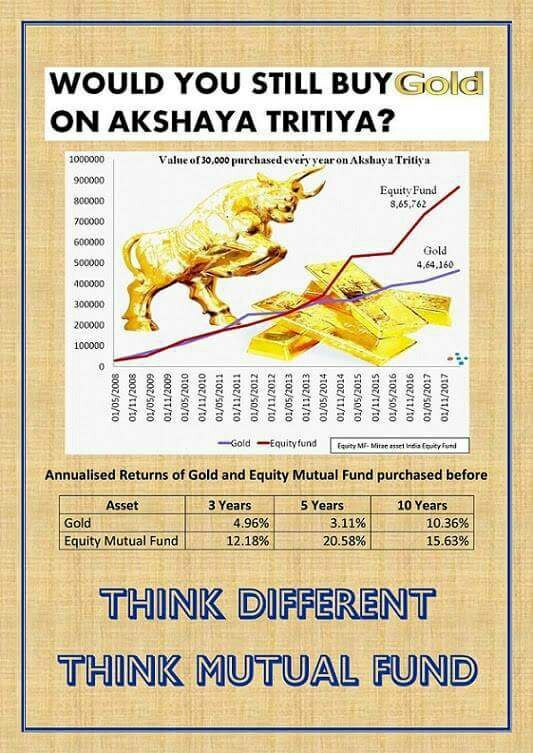 there is absolutely no technical or fundamental reason to buy GOLD on Akshaya Tritiya. If you research our Scriptures well, there too it is clear that Akshaya Tritiya is only meant for engaging in some GOOD DEEDS and not just worshipping Goddess Mahalakshmi. The GOLD CRAZE was created by our friends in Jewellery Business. Gold is not an investment. Gold is an allocation in Indian Households. 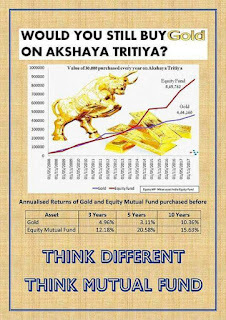 Continue buying gold in SIP for a specific purpose & allocation. Your wealth grow as per the potential of the asset you invest. 10mn tones under the sea is eye opener. Same happened with oil; eventually people dug under the sea after land sources were well discovered and prices kept climbing- oil came from sea! Its the Multi Stage Fracking Technology that changed equation for oil. Offshore was there, but the shale gas was the real gamechanger. And Crude Oil was never the same again. so, maybe maybe some day going forward something in technology breakthrough could just help us in laying our hands on that 10 billion tonnes of Gold lying in Oceans.